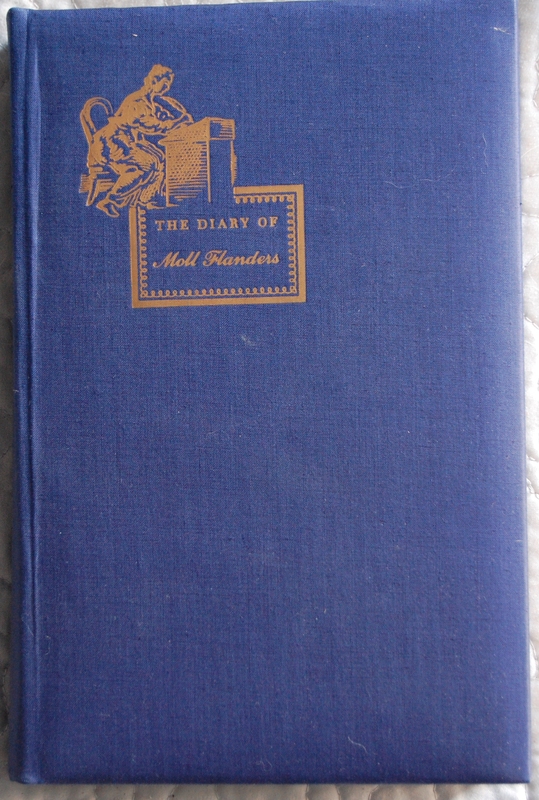 Front Binding – Today’s modernizing is of my very old Moll Flanders post, one of the first LECs I acquired! I still don’t have a letter for it, but my handy Quarto does include production details, so I can get into the story of this book just a touch more than I originally could. 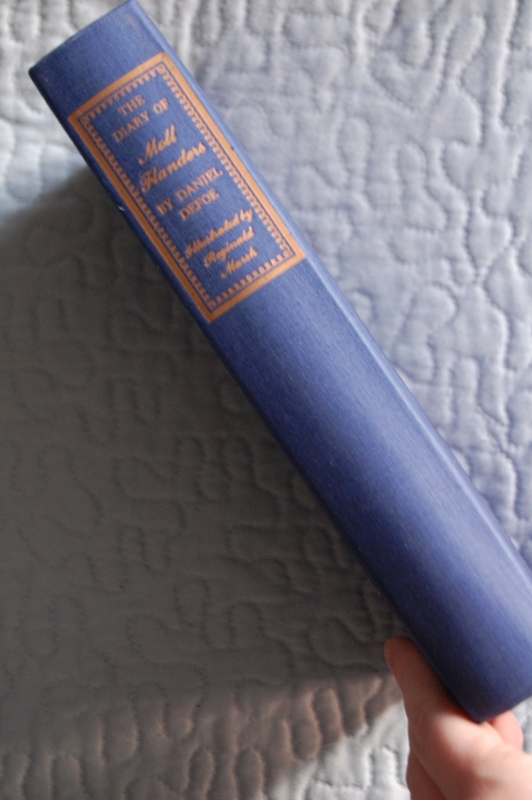 This book has a vibrant blue silk binding that is very soft and squishy (for lack of a better word). The motif was to have the edition come across as a lady’s private diary, and given the contents it’s an appropriate concept well executed here. Now if you looked over the heading of this post you’ll notice that it stated it was a Heritage Press edition originally; this is indeed the case, a relative rarity in the LEC’s history but not entirely uncommon. The LEC edition of Beowulf is another example, and I have an incomplete listing of other such publications in my Heritage Press Exclusives page here on the blog. 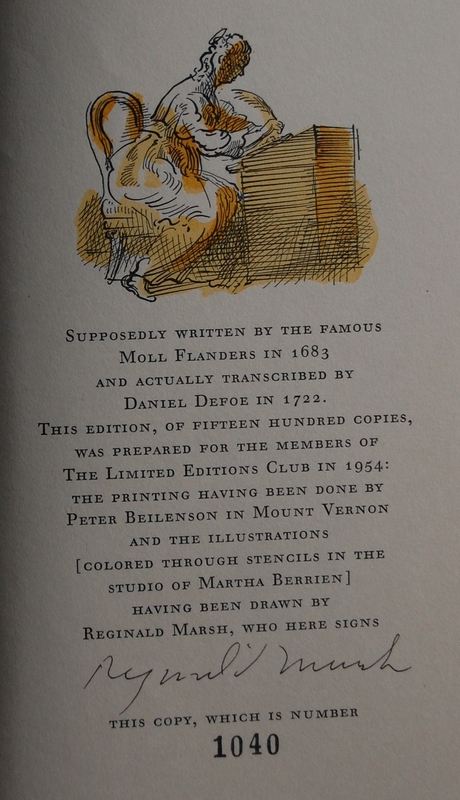 For Moll Flanders, the Heritage was issued back in 1942, twelve years before the LEC was printed. Typically whenever this happened it was intended to fill a gap caused by a planned LEC falling through or slipping past its deadline; I wonder what the reasoning was for this particular upgrade. Daniel Defoe, England’s first notable novelist and prominent journalist of his time, had a pretty prolific run with the Limited Editions Club, which I detailed in the Journal of a Plague Year post. This falls right in the middle of his bibliography, and would be the last George himself would have a hand in. Design Notes – Thanks to my Quarto, I can finally lift some mysteries about this book’s creation. George Macy himself handled the design duties; presumably he also was responsible for the Heritage? Marsh’s ink drawings were colored by Martha Berrien. The printing was handled by Peter Beilenson, with the font Waverly inked onto Ticonderoga Text paper. Russell-Rutter handled the binding duties. Printed at his Mt. Vernon press, which was the home of his own famous press, The Peter Pauper Press. Beginning in the Thirties and continuing to his death in 1962, the Peter Pauper Press printed many beautiful letterpress editions of classic works–nothing monumental in scope, but made with wonderful design sense and beautiful materials. The press also designed and printed several special editions for Random House and for the LEC. 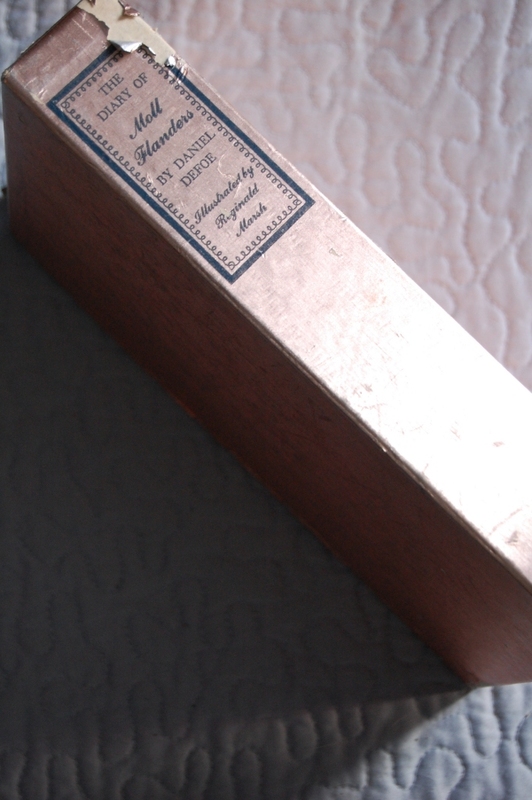 Slipcase – The slipcase was wrapped in a beautiful copper foil that compliments the blue binding and its copper stamps; alas, mine is falling apart. Django6924 mentions that the same cruelty has befallen both his and a relative’s copies, so it would seem that this foil was not meant to last (since this post went up I’ve heard additional reports about the slipcase foil being very sensitive). 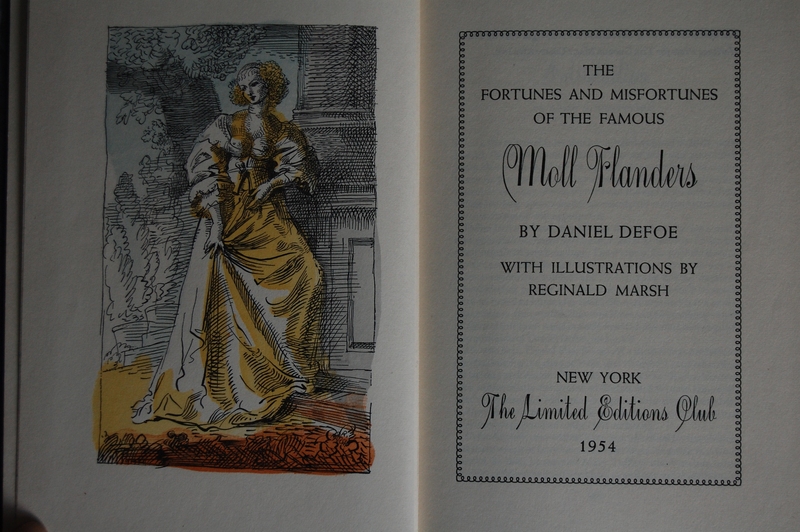 Title Page – Here the book is referred to as “The Fortunes and Misfortunes of the Famous Moll Flanders.” This was printed in 1954 by Peter Beilenson in Mt. Vernon. Unstated here, John T. Winterich provides an introduction, a commonality among Heritage exclusives. Signature Page – Here’s Marsh’s signature. The aforementioned Beowulf was unsigned by its original illustrator Lynd Ward, so it’s perhaps fortuitous that Marsh was available to provide his for this reprinting. This is #1040 of 1500. Page 56 – 57 – A nice piece of revelry and debauchery. 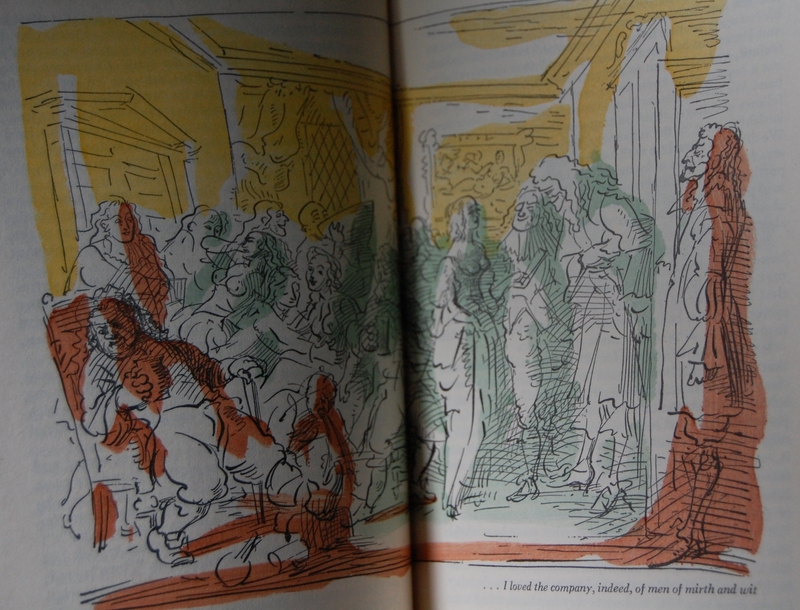 I found the vomiting gentlemen in red by the page divide to be a particular highlight for some bizarre reason. 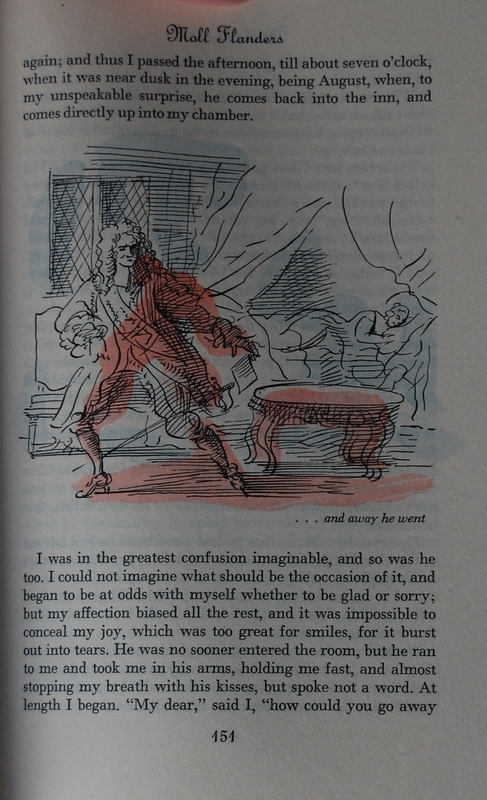 Page 151 – Most of Marsh’s work is in between the book’s text. Personal Notes – My first trip to Moe’s in Berkeley led to this purchase, an absolute steal at $15. To this day it’s one of the best deals I’ve ever had with a LEC (the best are my copies of The Way of the World and the second Three-Cornered Hat I acquired at my local Goodwill for $4 each). I have a feeling it was so cheap because of the slipcase’s poor condition; it really is a shame that the foil is falling to pieces. I haven’t read Defoe, but I’ve heard of the story of Moll Flanders, and Marsh’s work seems to be a good fit for the tale, so I’m content. And the cushy binding adds a lot to the joy of flipping through it. You are currently reading Limited Editions Club: The Diary of Moll Flanders by Daniel Defoe (1954) at The George Macy Imagery.